Grand Mirage is an apartment complex developed by The Conservatory Group. This project is located at 339 Rathburn Rd W, Mississauga. The apartment building will be 22 storeys high and will accommodate 344 suites. The apartments start from the 6th floor, and the investors and potential customers will have 13 different floor plans. The floor area of these suites will vary between 583 sq. ft. to 950 sq. ft., with the average price per sq. ft. of $683. The parking and locker prices are already included in the package, so no extra money has to be spent after moving in. As of March 20th, 2018, 85% of the suites have been booked, which goes to show just how popular this project is with the local crowd. The Conservatory Group put forward an investment friendly payment plan, with a minimum deposit of 20% only, with the break up being: 5% to be paid with the offer, another 5% in the next 120 days, 5% again in 366 days. And the last 5% on occupancy. The estimated maintenance charges per month are $ 0.49 per sq. ft. The locker and parking maintenances will be $ 6.56 and $ 26.24 per month respectively. These will cover air conditioning, heat, water, common area costs, and building insurance. Grand Mirage will offer 1 and 2 BHK flats only, with no option for a 3 BHK apartment. The floor area of the 1 BHK apartments ranging from 583 sq. ft. to 645 sq. ft. The 2 BHK flats have a floor area of 752 sq. ft. and go up to 950 sq. ft. Some of the apartments have a DEN as well. The suites sell in a range of $ 415,000 to $ 6448,000. The ceiling height of the suites is a standard 9’. This project is currently under construction, and will open to residents in April 2019. The residents of Grand Mirage will have a lot of amenities at their disposal. There will be a bowling alley where both adults and kids can have a great time. There would also be a fitness centre/Exercise room equipped with the latest equipment. Guest suites will also be available along with a conference room, a party room with a kitchen, an aerobics room, a cards room, a billiards room, Sauna, Outdoor entertainment terrace, an indoor pool and a whirlpool. Grand Mirage scores more on the location benefits than anything else. 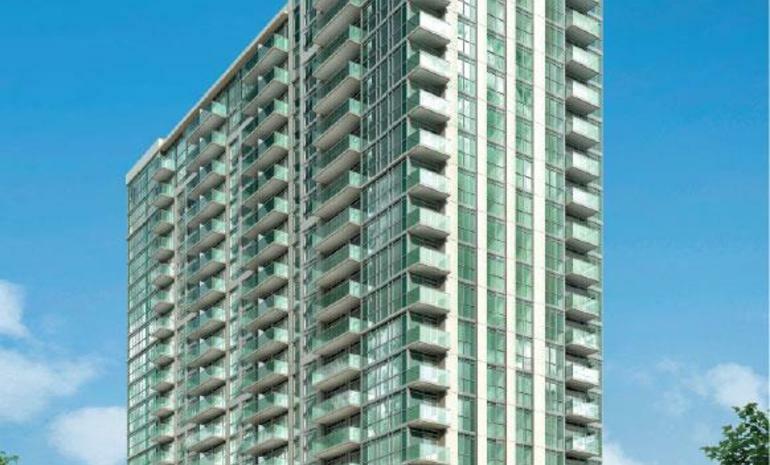 It is one of the most central, and conveniently placed condo development in Mississauga. Square One is right around the corner, and city amenities like Cineplex, Walmart, Whole Foods, and the lot is next door as well. Zonta meadows, and the Community Common park is close by, and the residents can spend quality alone time away from the rackets of the city. There are many schools nearby as well like Corpus Christi, Sheridan College Hazel McCallion Campus, Canadian Business College, and Fairview Public School. The Conservatory Group has developed many condos throughout Brampton, Mississauga, Scarborough, Ajax, North York, and more. Gymnasium with the latest equipment. 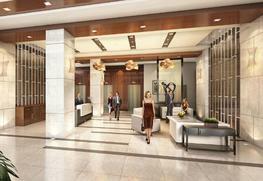 EZ own is offered with 1 bedroom with 1+ Den suites.